By and large, in my experience as a beer writer and beer drinker, people don’t really think of Atlanta’s SweetWater Brewing Company as a “big brewery,” especially outside the state of Georgia. The company has consciously projected an easygoing vibe since it opened in 1997, as evidenced by both their obvious nods to stoner/pot culture and mottos such as “Don’t float the mainstream.” Until the recent opening of their new Woodlands facility, even the SweetWater taproom hardly seemed like the public face of a brewery in the “large regional” tier. Rather, it’s roughly the same size and dimensions you’d find in thousands of smaller community breweries. You probably have a comparable taproom somewhere in your hometown. In recognition of the brewery celebrating 20 years with both their annual bacchanalia at the taproom and the release of 20th Anniversary Ale, I recently sat down with several key members of the team for beer and conversation. Meeting at Ormsby’s in Atlanta, a beer bar founded by former SweetWater salesman Michael Goot, I was joined by company founder Freddy Bensch, head brewer Nick Nock and “VP of Brand and Culture” Steve Farace for a deep dive into both the company’s history and its still-evolving identity as a leader in the Southeast’s craft beer movement. SweetWater Brewing Co. was the brainchild of co-founders Freddy Bensch and Kevin McNerney, who met as roommates at the University of Boulder, CO. Already obsessed with the burgeoning (but still relatively underground) craft beer movement, they worked as volunteers for Boulder Brewing, washing kegs on the docks. After studying at the American Brewers Guild in California, McNerney went on to gain experience at a string of prominent breweries, from Avery Brewing Co. to Mammoth Brewing Co. Bensch, meanwhile, was drawn to Atlanta by the 1996 Summer Olympic Games, where he quickly put down roots. One look around was all he needed to see that there were massive beer opportunities waiting to be exploited in the city. Among these somewhat seedy digs, the company built its first ever public face around launch beers such as SweetWater ESB (“the beer that got us noticed”) and Blue, a blueberry ale they’re still manufacturing 20 years later. Brown shag carpeting adorned the space, which also featured “a cactus so tall it wouldn’t fit into the tasting room, so we had to take the ceiling tile off.” It was a room filled with college furniture, discarded objects and curios rescued from the roadside. But there was also beer, and that was reason enough for some of those early, curious visitors to take a chance and stop by. At the time, the only other beer producers in the Atlanta area were Dogwood Brewing Co., Marthasville Brewing Co., and Atlanta Brewing Co., now known as Red Brick Brewing. Of those, only Red Brick remains today. Bensch describes it as a time of “beer for the masses,” which was upended in particular by the arrival of SweetWater’s hop-heavy 420 Extra Pale Ale. The development of the beer that would go on to become SweetWater’s flagship can only be described as a key moment in the popularization of hop-forward ales in Atlanta, offering a local alternative to the likes of California’s Sierra Nevada Pale Ale. But that doesn’t mean the beer was easy to sell, at least at first. In a mirror image of today’s bar market, which uses “fresh and local” as a selling point and greedily gobbles up all the available beer from hyped local breweries, SweetWater arrived into a market where the idea of “local” wasn’t nearly as vital or valuable. And it certainly didn’t help that potential beer accounts often had little to no idea about the differences in beer styles. It’s rather absurd to imagine a bar manager saying “I only need one local” today, when “our menu is local!” is a major part of the marketing copy at most any beer bar, but these were some of the prime challenges faced by breweries in SweetWater’s generation. They were sending their beers out into a sea of distributors and accounts still unprepared for the emergence of new brands despite the fast growth of the early ‘90s, and there were hardly enough tap handles to go around. Craft beer-focused bars were much rarer, especially in the Southeast. And at the same time, 1997 also happened to be the year of the first craft beer “bubble” bursting, when growth of the segment bottomed out for several years and the rejection of low quality contract-brewed beers hurt national investment in the industry. The hurdles that were standing in SweetWater’s way are not to be underestimated now, two decades later. It didn’t take SweetWater long to outgrow the limited scope of the original brewery west of Atlanta, and they were soon searching for a much more expansive alternative. They found it in 2003, acquiring a building on Atlanta’s Ottley Dr. north of Midtown and the I-85 expressway. The original location, if you were wondering, has since been acquired by a reclamation nonprofit organization “that takes old, dilapidated mattresses and furniture to clean them up for people who can’t afford to buy new,” according to Farace. In a sentiment you’re likely to hear reflected by just about any regional brewery in SweetWater’s size bracket, the company moved to its new building fully expecting there to be “enough space” to accommodate it indefinitely. This could hardly have proven more incorrect. “How many times have I said ‘I’m done building, that’s the end?’” asks Bensch to the other people at the table. “I’ve heard you say that at least four times,” Nock replies. Much of that expansion has been built on the back of 420 Pale Ale, and then eventually SweetWater IPA. When McNerney amicably stepped down as brewmaster after 12 years of hard work in 2008 (he’s now brewmaster of the Atlanta-based brewpub chain 5 Seasons), Nock took over the reins of everyday brewing operations. When I ask about the sanctity of recipes such as 420, and whether the company has tinkered with them over the years, he doesn’t hesitate in confirming that they have. “I’m not going to say that we haven’t tinkered with it, because we have,” says Nock, before Bensch jumps in with more insight. Another development key to the SweetWater identity was the discovery of “hop hash” as a signature ingredient. This sticky, resinous substance might well be thought of as a condensed “essence of hop,” still retaining the flavor and aromatic signatures of each varietal. It’s used for the year-round Hop Hash DIPA, as well as a pungent session IPA, Hash Session. Of course, canned beer is an obvious next step in the modern craft beer market for a brewery making well-regarded hoppy beer styles, and SweetWater was no exception. They canned their first 420 in 2013, after resisting the format for years because of limited brewing capacity. Ultimately, it was Delta airlines, flying out of Atlanta’s massive airport hub, that proved to be the catalyst. In fact, to Nock, the first 420 they ever cracked on an airline flight was something he refers to as a bucket list achievement. As our talk wore on, we discussed myriad “if you could” questions, probing the past and future of the company. If Bensch could bring back any departed SweetWater beer by guaranteeing a demand for it, his choice would be Exodus Porter, a former GABF medal winner that was sadly discontinued back in 2013. He considers Hummer, a Belgian witbier, to be the most disappointing beer that never found an audience. And he believes that the future of the company lies in its new Woodlands barrel-aging facility, along with the taproom-exclusive Hatchery Series, which produces small, experimental beers at the creative whim of the company’s employees. Since beginning a few months ago, the Hatchery series has already produced about two dozen brand new beers, which have by and large only been consumed in the SweetWater taproom. The first to receive commercial distribution is a new single-hop Mosaic IPA, which is currently available. We also discuss some of the ugly truths of the current craft beer market. As confirmed in Tuesday’s final 2016 numbers by the Brewers Association, growth in craft beer has finally receded from what had been a very steady 12-15% by volume each and every year, coming in at 6% by volume in 2016. Many larger, nationally available craft breweries such as New Belgium, Sierra Nevada and Boston Beer Co. are feeling the pinch and seeing actual declines in sales for the first time in a decade, with the industry’s growth being driven largely by the smallest segment of breweries, who may be poaching the sales of the larger companies. In that sense, SweetWater actually stands out for the fact that their year-end numbers for 2016 were still positive, according to Bensch. One thing that really can’t be argued is the huge shadow that SweetWater’s influence casts over the Atlanta beer scene, and by extension the entire Southeast. 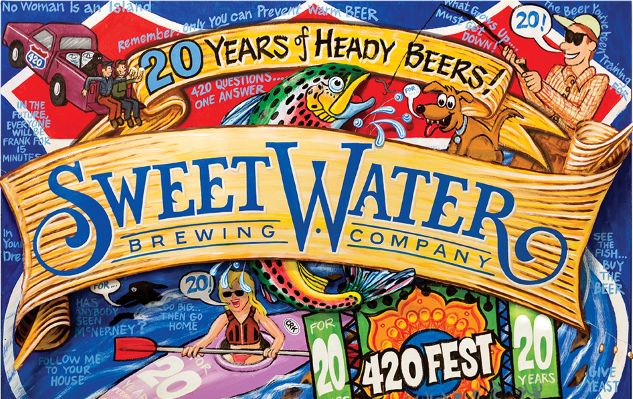 Everywhere one looks in local beer, there are reminders of SweetWater’s 20 years in business, from breweries such as Creature Comforts, whose brewmaster Adam Beauchamp worked as a brewer under Nick Nock, to the original brewing equipment itself, which has lived several lives. The brewing system currently at Avondale’s Wild Heaven Beer? It came to them from Terrapin … after it originally came from SweetWater. So it is in any matured craft beer scene; communities that still maintain a reputation for decency and good-naturedness, even though they’ve long since left the “niche” designation behind. They may have left the shag carpeting and cactus behind as well, but SweetWater has retained the spirit they brought to Atlanta in the wake of the Olympic Games. Here’s to another two decades of heady, hashy brews. Jim Vorel is a Paste staff writer who has built a fairly concerning hash tolerance. You can follow him on Twitter for more craft beer stories.